A little over 200 million years ago, when Earth had only one mega-continent called Pangaea, fifty percent of life in the oceans died abruptly. What happened? Researchers long believed that this event, called the End-Triassic mass extinction, might have been caused by intense volcanic activity as Pangaea broke into two smaller continents. But a new study released today in Science suggests that the ocean deaths were caused by "a massive release of carbon into the atmosphere, followed by rapid climate change." Earth scientist Micha Ruhl and colleagues examined ancient plant fossils, and based on their molecular analysis it appears that "at least 12,000 gigatons of methane was injected into the atmosphere over just 10- to 20,000 years of the end-Triassic extinction." The researchers suggest that this short-lived burst of methane was more likely responsible for the mass extinctions. Changes in vegetation at the end of the Triassic Period also provide evidence of strong warming events and an enhanced global water cycle at the time, they say. 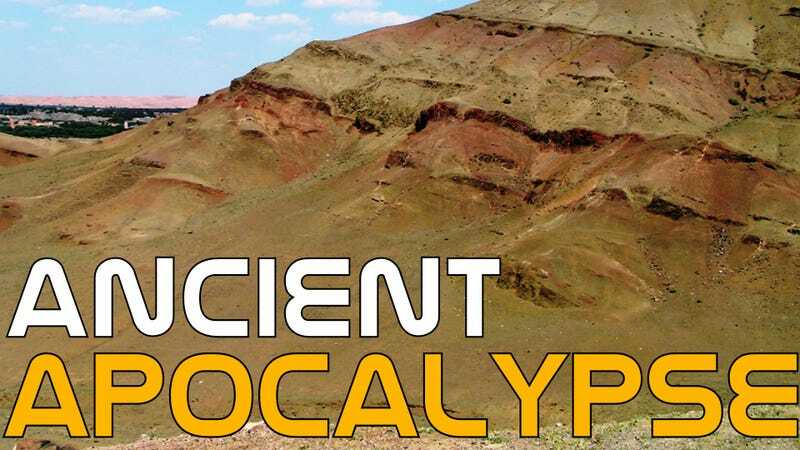 Ruhl and his colleagues also say that their findings may help scientists plan ahead, since humans could potentially contribute 5,000 gigatons of carbon or more to the atmosphere if we were to burn all of our known fossil fuel reserves. So if history is any guide, humans' injection of carbon into the atmosphere might ultimately kill off half of all ocean life — or more. Read the full scientific paper via Science. Province (brown), in the Atlas mountains (Morocco).